Brindavan is closest to Shri Swamiji’s heart because it was Bagavan Sri Krishna’s ‘vaasasthalam’. Sri Swamiji has gone on innumerable yatras to Brindavana. It was Sri Swamiji’s desire that we should have a place in Brindavan bhoomi for our Premika Varadan and Madhuri Sakhi. A breathtakingly beautiful Prema Madhuri samedha Sri Vrindavana Vihari consecrated in the year 2013, bestows His Divine Grace in the holy town of Vrindavan. Pooja is conducted as per Bhagavata Dharma. A temple/ Vedapatasala complex is proposed. Nitya Pooja is being performed as per Bhagavatha Dharma. 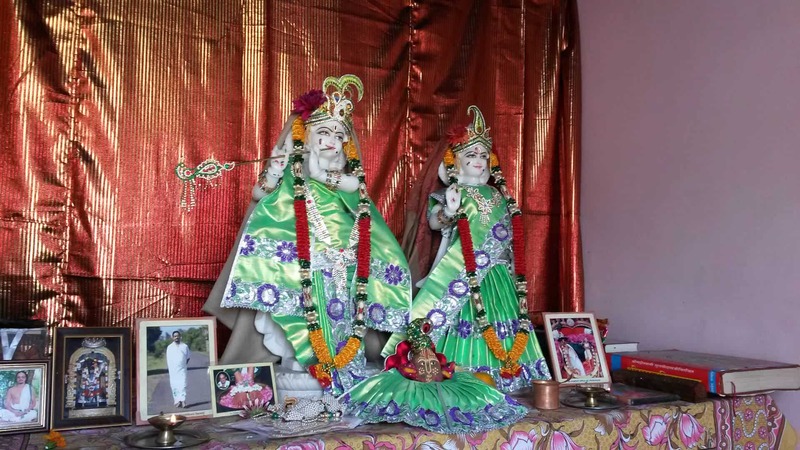 Sri Govardhana Giriraj from the holy hill of Govardhan is also worshipped here. This sannidhi was inaugurated by Sri Sri Anna. Our place in Brindavan happens to be in a beautiful location near one of the most ancient temples of Brindavan, the Katyayini mandir. Sri Swamiji has named it Sri Niketanam – a place where Radha Rani resides even today. The name ‘ShriNiketan’ comes in Gopika Geetam. Sri Swamiji has taken our Premika Varadan and Madhuri Sakhi to ShriNiketanam in Bridavanam and their ‘aradhana’ has been done there. Sri Vrajadasji, an ex army person, took retirement from service and now stays here full time in service of Bhagavan. Sri Yuvaraj assists Vrajadasji in pooja kainkarya. The administration of all our establishments in Vrindavan, Gurugram and Delhi are taken care of selflessly by Smt and Sri Bhaskar ji.